This comes out of your freezer and tastes JUST LIKE TAKEOUT! Im not joking here either. Its amazing! The cool thing is you can make it in mass quantities and freeze it. Just thaw the bag and in 10 minutes you have dinner! I adapted my version from this recipe from the oamc guru Tish at the Zaar. Its a gigantic recipe. I make 8 freezer packets from it. (feeding 2 people) Feel free to divide it to meet your needs. 1. Mix everything is a large bowl. 2. Portion, label and freeze. I get 8 bags out of this with 2 servings each in them. Portion your bags according to your family's needs. Just adjust the quanties below. Very nice blog and congrats on the foodie blogroll! 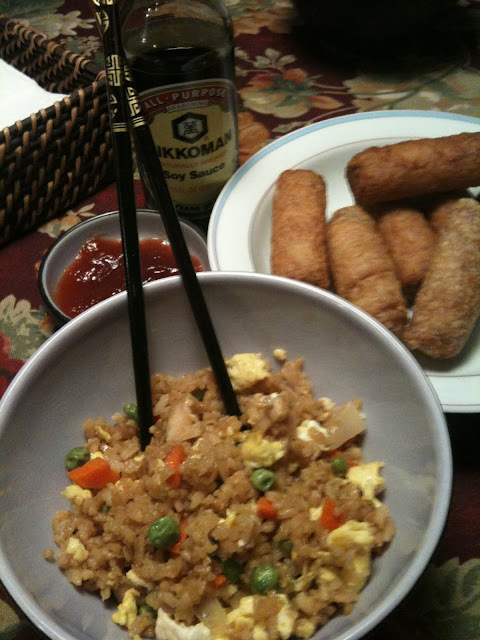 Your fried rice recipe looks really good. This would be a perfect fast, healthy, weeknight meal. Thanks for sharing. I like your new blog. Are you not scrapping anymore? Where'd your other blog go? I'm going to have to try out this recipe. I have chicken left over waiting to do this with! Hope you little one is doing good. This looks great! I love the idea of freezing. Thanks for the great recipe! i made this the other night, really good!!! thanks! i posted ab it on my blog.